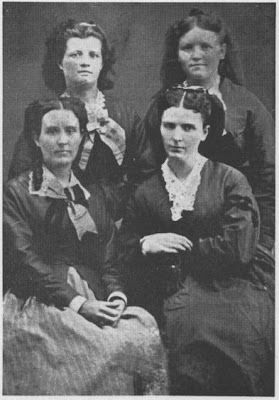 Dr. Ellis Ship and her "sister-wives"
Did you know that the early days of the Mormon church, midwifery was a spiritual calling? That a woman was called to be a midwife by priesthood authority, often after having been nominated by the Relief Society, and set apart by the laying on of hands. She was usually set apart by a General Authority of the church, if available, and the calling was for life, much like the calling of Patriarch. I've been doing a lot of research about early Mormon midwifery and women's birth experiences for the book I am helping with. I have some incredible stories. Read more about it on my guest post "Midwifery as a calling" at The Gift of Giving Life. This is one of the most honest book I have ever read on Mormon women, included in it is a section on Midwifery. If you haven't read it, do so if for no other reason than to read more about these amazing women. Thanks for the book recommendation. I'll have to take a look at it! Hi! I just found your blog and have been looking around. What a cool blog! Thank you sooo much for creating it and keeping it alive. We havent been able to have children yet but when we do I KNOW I am suppose to have a home birth. Which is kind of odd to me because I always thought it was a little nutty. Its interesting however that when things are done in love and faith and not fear, peace is there and answers can not be denied. It is so darn good to know there are other people that love this as well! encontrei se blog e AMEI!! Gosto muito das coisas que você escreve. Você é muito inteligente,obrigada pelas coisas bonitas de seu blog. Power or Influence: Which Would You Choose?